Fluoride is an all natural element that is present in water supplies, minerals, and many foods. 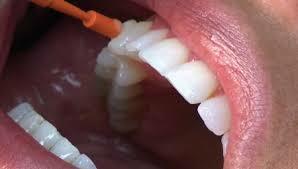 When it is delivered to the tooth surface it can dramatically reduce the rate of caries and have a reparative effect. Fluoride treatment works primarily and most effectively as a topical mechanism (whether it is being delivered through drinking tap water, foods, products, or beverages) to remineralize tooth structure, to prevent demineralization and to inhibit plaque bacteria. When fluoride is present on the tooth surface and in plaque it inhibits acid demineralization by reducing the solubility of the tooth mineral. Fluoride treatment accelerates the remineralization process by adsorbing to mineral crystals within the tooth and attracting calcium ions. In addition, fluoride ions incorporate into the remineralizing tooth structure, resulting in the development of fluorapatite-like crystals. These crystals are less soluble than the original enamel mineral and make remineralized lesions less susceptible to future demineralization. In plain English, fluoride helps strengthen your teeth and prevents them from eroding! Everyone can benefit from the use of fluoride treatment and it’s effects through their toothpaste, although, some patients may need an added amount due to different circumstances such as root exposure, sensitivity, high plaque levels, dry mouth and the individual’s caries risk. Don’t forget to ask your dentist or dental hygienist if you can benefit from added amounts of fluoride.